Intel heads into 2019 facing a number of challenges. Stealing a page from Apple’s recent earnings warning, Intel blamed a lack of demand in China as one of the reasons for reporting healthy fourth-quarter profits that were nevertheless less than Wall Street expected. Intel’s fourth quarter, traditionally the company’s strongest, capped what Intel said was a record-breaking year in terms of revenue. But Intel blamed China, weakness in cloud-computing customers, a weakened modem market, and an inability to manufacture enough processors as reasons the company’s revenues did not meet expectations. Intel’s manufacturing woes have been a source of questions since 2018, as has been when Intel will name a replacement for Brian Krzanich, Intel’s former chief executive, who unexpectedly stepped down about seven months ago. 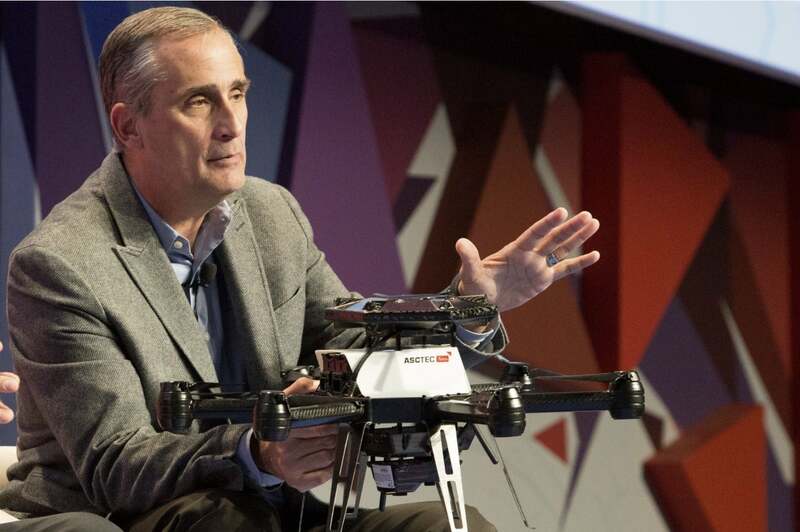 It’s been more than six months since former Intel CEO Brian Krzanich’s departure. Intel disappointed Wall Street by reporting $5.2 billion in profits, compared to $18.7 billion in revenue. (Analysts polled by Yahoo Finance had expected earnings per share of $1.22 on revenues of $19.01 billion.) They also expected Intel to forecast $17.37 billion in revenue for the first fiscal quarter, ending in March. Instead, Intel said it expected to book $16.0 billion in first-quarter 2019 sales. Intel blamed a number of factors, but China was a high-profile scapegoat. Apple had previously blamed for its own earnings warning. For the current quarter, Intel sad that a slowdown in China, weaker sales to cloud customers, a weakening NAND flash market, and weaker modem demand contributed to the lower fourth-quarter sales. Looking forward, Intel said it sees trade and “macro” concerns intensifying, especially in China. Intel’s first-quarter 2019 numbers aren’t what analysts expected to see. Intel’s Client Computing Group saw strong demand for its higher-performance products, including gaming. Intel’s PC-centric CCG grew 10 percent during the fourth quarter, to $9.8 billion overall. CCG still is Intel’s largest business, though Intel’s Data Center Group continues to climb: the unit reported $6.1 billion, up 9 percent year-over-year. PC volumes, though, fell by 2 percent, which Swan blamed on Intel’s inability to manufacture enough chips. “We expected a stronger finish” to 2018, Swan said. Swan told analysts that part of Intel’s inability to meet expectations has come as the company has struggled to transition to the 10nm manufacturing node. 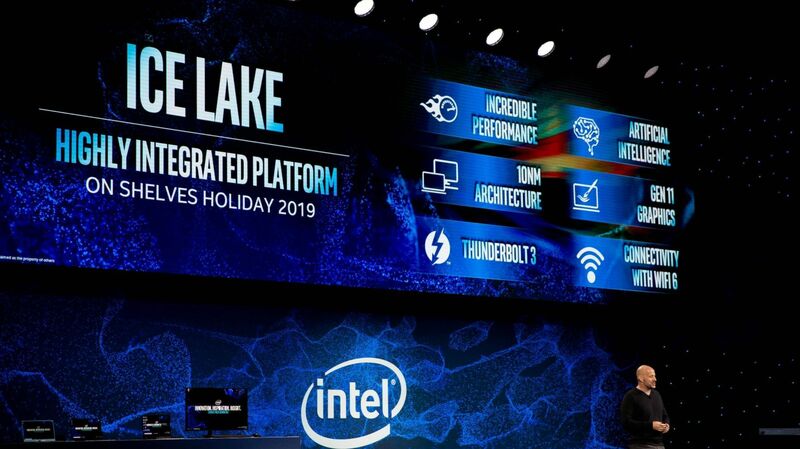 Intel spent the recent CES in Las Vegas describing the company’s wholesale switch to 10nm, including Ice Lake, its next-generation processor, which is still on track to ship by the 2019 holiday season, Swan said. Intel is pinning its hopes on Ice Lake, its upcoming 10nm CPU. The shortages were and are the most pronounced in the value end of the PC market, as Intel’s strategy is to prioritize Xeon chips for servers—where there are “no shortages,” Swan said—and so-called “big core” products at the high end of the PC market. “Big core” chips like the Core i9 will be prioritized over “small core,” mid-range processors, followed by the cheapest “value” chips. Though he didn’t say so explicitly, it appears that Intel’s ceding the low end of the market to rivals such as AMD. Swan said the total available PC market was essentially flat. The fact that Intel’s PC sales fell by 2 percent, Swan said, was directly tied to the shortages. In the meantime, Intel appears to be doubling down on its areas of strength—which, not coincidentally, are where it can turn high profits. Oddball chips like the Core i9-9990XE, which Intel will sell at auction—yes, to the highest bidder—indicate that Intel will try and milk its high-end chips for all they’re worth. Intel’s numbers also indicated two trends in the PC business. Though notebooks are selling well (up 8 percent year-over-year in revenue), they’re not making much money per device (as average sale prices rose 6 percent). Buyers might be buying fewer desktops, as evidenced by the fact that desktop PC sales grew just 3 percent. But desktop PC prices soared 13 percent, indicating that gamers are investing in their desktop rigs. But what hurt Intel can benefit consumers. Intel cited a weakening market for NAND flash, and forecast that the trend will continue. That’s good news for consumers planning to convert to or invest in SSDs, which should continue to decrease in price. In the meantime, there’s already been talk of SSD prices plunging throughout 2019, making great deals like this Samsung SSD more common. You’re already seeing 500GB SSDs for about $60 (though some use the SATA interface, rather than the faster NVMe). Intel’s latest Optane innovation combines Optane and flash memory on the same PCB. Swan said that Intel is “not too excited” about being in a commodity flash business, and that the company is seeking differentiated roles for flash memory and its Optane technology. A recent example of that strategy was the company’s hybrid flash-Optane M.2 card it showed off at CES. 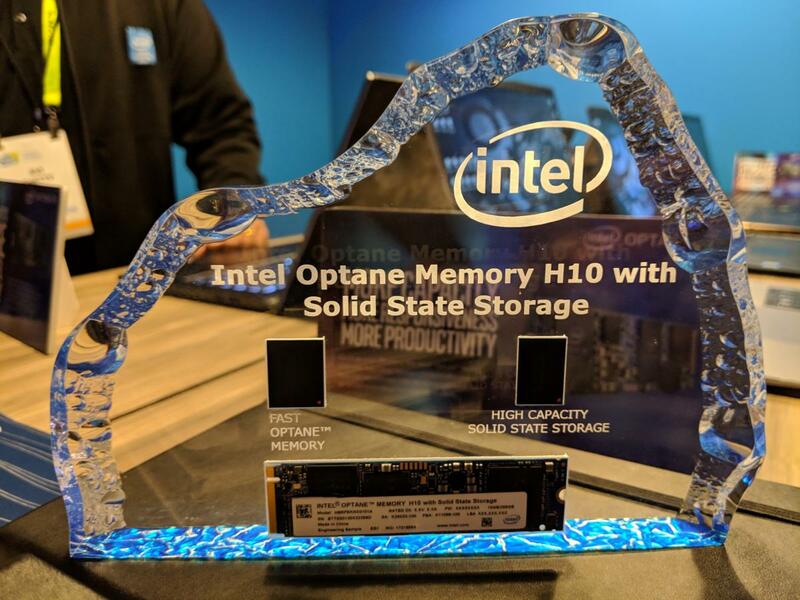 As for Optane itself, Intel’s message was that it won’t be hampered by one-time partner Micron’s decision to buy up the plant that Intel and Micron used to manufacture Optane, more generically known as 3D XPoint. Swan said that a number of products were on tap to take advantage of Optane, though it’s unclear what Intel’s manufacturing strategy will be. Intel executives concluded by saying that they didn’t believe that conditions were that different than a few months ago, in October, when Intel predicted a slightly rosier outlook. This year, 2019, should be another record year of revenue, Swan said—its fourth in a row. But 2019 should also be a challenge. That guidance includes Intel’s prediction that it will successfully fight to protect its position in the face of increased competition, Swan said. Trade issues, a manufacturing conversion, and an aggressive AMD all mean that Intel will be fighting to keep its lead.